Summary: Three bedrooms and one full bath. Located in Annville, minutes from Hershey, Lebanon area businesses and 15 minutes from Harrisburg and I-81. Bedrooms: Features one or two queen beds with night stand, alarm clock, desk with Ethernet access. TV, phone, and dresser. Most suites have walk-in closets off the bedroom area with iron and ironing board. Kitchen: Oven, microwave, refrigerator, toaster, coffee maker, pots, pans, cookie sheets, dishes, glasses, mugs, dish towels, dish sponge, dish soap, silverware, spatulas, colander, and bottle opener. Housewares: Bath and hand towels, washcloths, and floor mat. Hangers, iron and ironing board. Vacuum, broom, and dustpan are available in the laundry. Bedding includes sheets, blankets, comforter and extra pillows. Our Annville House is a single family home that is part of a collection of ten fully furnished studio, one, two and three bedroom units. 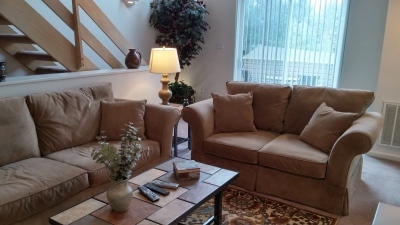 Each home is decorated with an area theme that provides each unit a unique look and feel that can only be found in Hershey. The rental rate includes high-speed wireless internet, Ethernet, and cable TV's are provided in each room of this Suite. There is a full, eat-in kitchen, living room area with two couches, a bathroom, and all three bedrooms on the 1st floor. The bedrooms range in size from a queen, twin, and twin bunk beds, each bedroom has its own sink and vanity. 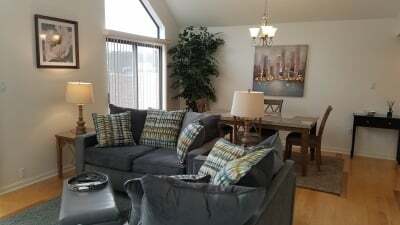 There is a 15 day minimum for our fully furnished suite. Weekly cleaning service is provided and includes general clean up, and changing the sheets and towels. There are also two coin-operated washers and dryers on the site, as well as off-street parking. 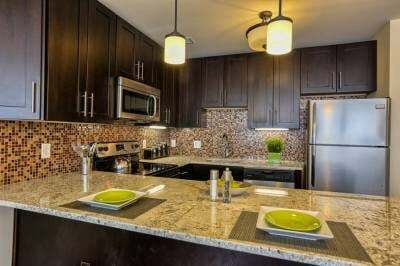 As for what’s around, The Hershey Company offices, Hershey Medical Center, Hershey Park, Hershey Theater, Tanger Outlets and Hollywood Casino are all minutes from the Suites. All of these and more are listed on a document in each Suite for your convenience. With RT 422 just out front navigating around is easy. Heading east will take you to Palmyra, Annville, and Lebanon while heading west takes you through Hershey, Hummelstown and onto Harrisburg. Guests interested in this property also showed interest in these homes in Hershey and Harrisburg. For more information on our other locations in or near Hershey please "click links below".